Nancy Fulda is an assistant editor for Jim Baen's Universe and the site administrator for AnthologyBuilder. She is a Phobos Award recipient, an Apex Digest Featured Writer, and a two-time Writers of the Future finalist. Hi! Thanks for agreeing to do the interview! First off, how did you first get interested in speculative fiction? I'm not sure speculative fiction is something you get interested in so much as something you discover you're obsessed with. I've been reading science fiction and fantasy for just about as long as I've been reading anything at all. Who were your favorite authors back then or what were some of your favorite books? How about now? The series I remember most vividly is ElfQuest, by Wendy and Rchard Pini. My older sister had borrowed Book I from a friend, and I guess I knew better than to ask her permission to read it because I snuck it away from her side while she was watching tv. I read the whole book before she noticed it was missing, and that was the start of the fannishness. For a long time, I read nothing but ElfQuest, drew nothing but ElfQuest characters, and wrote nothing but scripts for ElfQuest-style graphic novels. Some of my other favorite authors were (and still are) Lois McMaster Bujold, C.S. Lewis, Isaac Asimov, Anne McCaffrey, and Timothy Zahn. Did you always know you wanted to become a writer? How about editor and all-around web mistress? I always knew I wanted to write. I even knew I had a decent shot at getting published someday, because my English teachers tended to write notes about "creativity" and "nice language" next to my essay grades. But the other stuff took me by surprise. How did you end up becoming the editorial associate at Jim Baen's Universe? Quite by accident. I'd been hanging out in the Baen's Universe Slush forum, submitting stories and critiquing work by my peers, when I suddenly got an email from Paula Goodlet. She said she'd been impressed by my critiques and was looking for someone with an editorial eye to help read slush for the magazine. I said yes, of course. I would have had to be an idiot not to. What attracted you to Jim Baen's in the first place? The friendliness. The Baen's crowd is wonderfully informal. After several years running the gamut of stiff professionalism that predominates at some magazines, it was refreshing to hang out on the same forum as Baen's editors and listen to their frank remarks about the stories. What are some challenges you run into as editorial associate? Well, I hate rejecting people. I especially hate rejecting people when I love the story but know it's not a good match for the magazine. And I hate rejecting people I know personally, which, these days, feels like about three-fourths of the industry. Being on the editorial staff also makes me self-conscious about submitting to the magazine. Paula said there was no rule against submissions from the slushers, but I was still concerned about the possibility of nepotism. I submitted "Pastry Run" under a pseudonym and was immensely pleased when Benja Fallenstein picked it out of the slush and, subsequently, Eric bought it. What was one of the most important things you've learned so far as an editorial associate? That there's no such thing as a "One Size Fits All" story. Readers are indredibly varied in their tastes. Some like plot-driven action-adventure stories. Others like character-driven narratives full of poetic prose. You're never going to write a story that every single reader likes, so don't bother trying. Find the style you love and work to please *those* readers. That's how you learn to write good fiction. With regards to your writing, why short fiction? Practicality, mostly. Short fiction is faster and easier to write, and faster and easier to sell. Do you have plans of writing a novel in the future? What were some of the difficulties you ran into breaking into the industry? How did you overcome them? I'd say my story's fairly typical. I made my first submission to Analog when I was a teenager. The manuscript was single-spaced with my name and the date in the upper right-hand corner and a large, fancy-font title on the front page just like the ones I used for my high school essays. I'm not sure whether or not I included an SASE. In retrospect, it's not surprising that I received a brief form letter rejection. I then made Classic Mistake Number 1, and didn't submit anything else for several years. I don't know what it is about new writers, but we tend to get our first rejection and think, "Well, that's it. I guess I'm not cut out to be a writer after all." Anyway, nearly a full college degree later, I submitted to the Phobos short story contest on a whim. I learned about the contest around 10:00 PM. The deadline was at midnight on the same day. I'd lost the computer file for the story I wanted to submit and had to type it in by hand. I missed the deadline by about half an hour, but the contest judges were merciful. "The Man Who Murdered Himself" was accepted and placed in the contest alongside authors like Eugie Foster, James Maxey, and Eric James Stone. 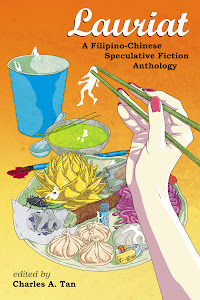 I remember having a revelatory moment when I read through the bios of the other authors in the anthology and thought: "Holy cow, if I can make it into a Table of Contents next to these people, maybe I can make it as a professional author after all." Was residing in Germany ever a hurdle? So far, no. It means I don't attend many conventions, and I have to funnel my snail mail submissions through a state-side mailer to save on postage, but I don't see those as significant problems. Pesky inconveniences, but not hurdles. What's the speculative fiction scene in Germany like? About the same as in America. There's not a lot of short SF published in German. Novels, yes, but not shorts. There aren't enough native speakers to support the market. Even the novels are usually translations of English books. So most Germans who want to write serious speculative fiction end up doing it in English and hanging out with the American crowd. What made you decide to set-up Anthology Builder? Pure self-interest. I've always wanted to be able to pick and choose my own anthology content rather than buying magazines where half of the stories bored me. When I first posted about the idea, there was such a positive response on my blog that I found myself getting more and more excited. In the end, it was almost a compulsion. Once the idea took hold, it would have been very difficult for me to restrain myself. I'm sounding like a broken record right now but what were some of the difficulties you had to overcome in establishing Anthology Builder? The biggest problem was finding a programmer. My initial plans for the site were fairly modest, but of the several programmers I consulted, none of them were willing to build it for the amount of money I'd budgeted. I have a degree in computer science, so this was doubly frustrating to me. "It's not that hard," I kept muttering my husband. "I could almost write the thing myself." In the end, that's what I did. It involved teaching myself PHP, learning how to administrate a web site, and brushing up on MySQL and Linux syntax, but it was also the best thing that could have happened for the site. No web designer on this planet would have put up with the number of tweaks and customizations I later discovered that I wanted. If I had managed to hire a programmer, he or she would have quit long ago. Can I ask that as a business whether it's feasible and turning a profit or not? Right now, the site is paying for its own hosting and production costs, as well as the royalties for our contributing authors and artists. Once we leave beta, I expect to see enough business to make the time I've invested worth my while. The thing that amazes me about AnthologyBuilder is how enthusiastic people are about the idea. They tell their friends about it just because it's cool, and their friends then stop by and buy an anthology. I had one reader email asking me to let her pay by check because her PayPal account wasn't working. She bought several anthologies and sent a second email to let me know how much she enjoyed the stories. What are your plans for Anthology Builder in the future? They are legion. The most immediate task is to finish sprucing up the site and move out of beta. After that I'd like to explore the option of partnerships with online fiction repositories such as FictionWise and Project Gutenberg, as well as supplemental features to help teachers create customized textbook anthologies. We'll also be releasing an Open Market, separate from the main AnthologyBuilder site, where authors can upload any story they wish regardless of its publication history. Do you have any other projects lined-up right now? What, don't you think I'm doing enough already? The nerve of some people! How do you manage to find the time to juggle everything? You know, this is going to sound crazy, but the single best thing I've done for my career is to make it less important than my family. My husband and I have three children. For a while, before #3 arrived, I was pushing really hard on my writing and on my work with Baen's (AnthologyBuilder was still a vague idea at this point). I felt overburdened and annoyed that the kids always seemed to pester me when I was in the middle of something important. Somewhere along the way I realized the stress wasn't worth it and decided my family had first claim on my time, period. I stopped rushing to the computer to write "one more sentence" during the kids' playtime. I stopped working late after the kids were in bed and started spending the evenings with my husband instead. Basically, I stopped working anytime except mornings while the kids were in pre-school. Like I said, it sounds crazy: but most of the good things that have happened to me career-wise have happened since then. It turns out that happy kids leave more brainspace for effective writing. Go figure. Don't put your writing ahead of your family. It's not worth it. Also, don't worry too much about all the conflicting feedback you get from your critique group. Find the type of fiction you love to write, learn to write it well, and trust that it will find a home somewhere. Don't risk anything you're not willing to lose. This includes, but is not limited to, money. Also, don't make the mistake of thinking it was wrong to try something just because it didn't work out. If you try and fail, at least you know that. If you don't try, you're likely to lie awake nights for the rest of your life wondering what might have happened if you'd given it a shot. * Go build your dream anthology at anthologybuilder.com! We've got five or six stories from the Nebula Preliminary Ballot, so this is a handy way to catch up on some Awards reading. * You can listen to me ramble at nancyfulda.livejournal.com. I don't post daily, but I like to think that when I do post, it's useful. * And should you someday see a book by Nancy Fulda at your local bookstore, pick it up and flip through it. If you don't, you may spend the rest of your life wondering what you missed out on. Great interview, Charles. And it's always nice to read thoughts from a non-American. Nancy's livejournal is also good, but I'd love it more if it was syndicated. That way I can be educated and lazy! Fantastic to hear that Nancy puts her family first. I've always tried to do that. It gets frustrating at times - my recently released debut novel was nearly five years in the making but I'm glad I didn't compromise and ditch my wife and children. Nancy's right. They are more important.